While it Lasts was a bit different from Abbi’s previous works. In a good way of course. 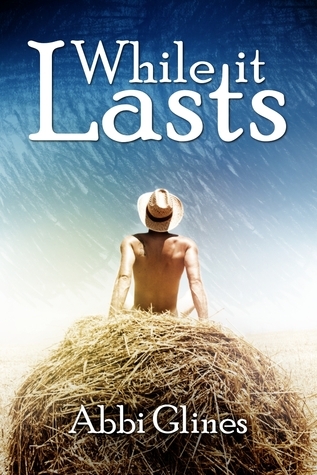 When I started reading WiL I couldn’t believe it was considered an adult book. The reason why, is because I felt that it had a little bit of Young Adult, New Adult and Adult in it. Somehow Abbi made it work. So I’m going to divide my review by genre. This is of course my opinion. What I thought was Young Adult. Eva acted how a YA character would act. She wasn’t immature; she was innocent, sweet but also a fighter. She brings the nice Cage out but at the same time Cage brings the feisty out of her. To me, they balanced each other out. What I thought was New Adult. The whole vibe of the book was New Adult. It was fun not as limited as the Young Adult genre could be sometimes. I feel like authors have more freedom when writing a New Adult book. What I thought was Adult. Cage. Oh my! He was such a delicious character to read. He was so different from Abbi’s other characters, except from Beau. Cage was 100 times worse than Beau or should I say better? Let’s go with better! I have to say he’s my favorite Abbi Boy. * Blushes* So, eh… Yeah this part of the book was definitely adult! Overall While it Lasts was a mix of everything awesome. It gave me THE feeling. You know the feeling that you don’t want to do anything else but read? The butterflies in the stomach? The Giggles and giddiness? No? Well if you read While it Last you’ll get the feeling. Let’s call it the Abbi Feeling. Because the first time I felt it was when I read Breathe. Which is another fantastic book by Abbi Aka the queen of awesome!